When you are in Dubai, anything is possible. Talk about the craziest thing a man can ever do, and experience that turn into a reality. Who knew man was ever capable of building snow castles on a deserted land? Who knew that a sequestered land of sand dunes would one day turn into the biggest entertainment zone with Arabs chilling in. There’s more surprises than you’d think that Dubai would ever have. 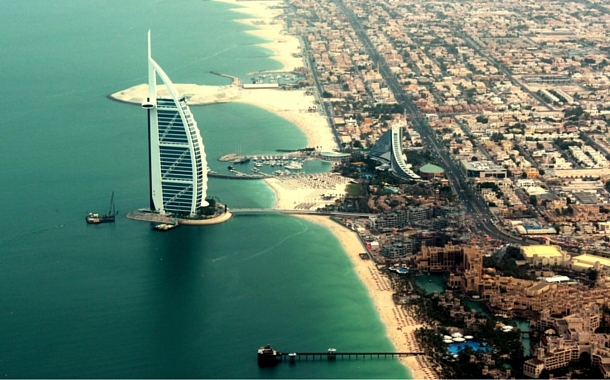 Apply for your Dubai visa and find out how Dubai is the best. Here are a list of top 10 picks that will entertain you more than any Bollywood movie. 1. A desert party with the Arabians. The slothful camels trudge slowly over the Arabian sand dunes as the gleaming tourists enjoy a desert journey over its hunchback. The sun sets over these formidable dunes and huge cars roaring with tourists bash over it. As the day dilutes into the dusky night, an ubiquitous Arabian party lights up its darkness. A graceful belly and tanoura dancer flaunt best of their moves and a horde of tourist chill with the Arabs. One can even wear the traditional Arabic white thawb along with a checked headgear to click photos with a trained falcon resting on your wrist. Girls can pretty themselves up with a mehendi tattoo and join in the party along with a barbeque dinner. 2. 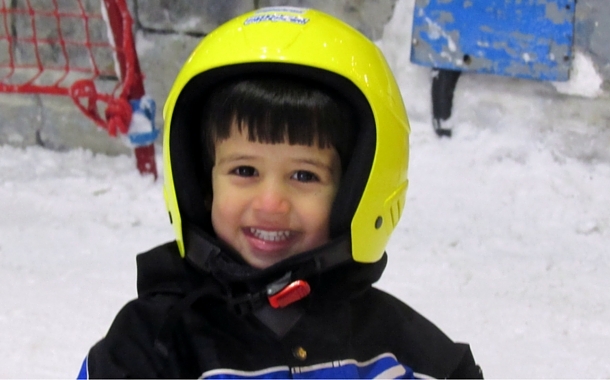 It's always snowy in Ski Dubai. You cannot challenge the Arabs, I repeat - you simply cannot challenge them. 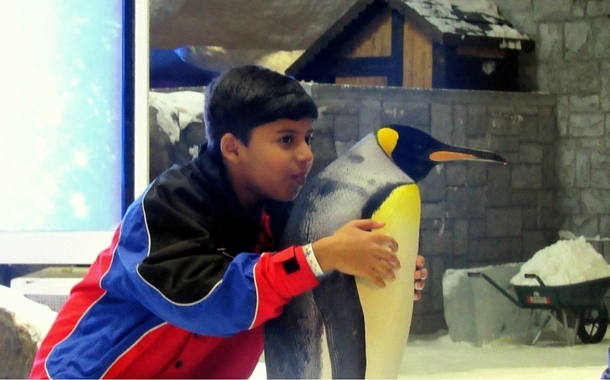 In a barren land with absolutely no hope, a temperature controlled zone with snow castles, penguins, ski slopes, tube rides and zorbing was created. Kids or adults, one cannot stop but amaze at this piece of beauty. They also have a chairlift ride with the view of the entire snow park; quite reminiscent of the times in Switzerland. 3. 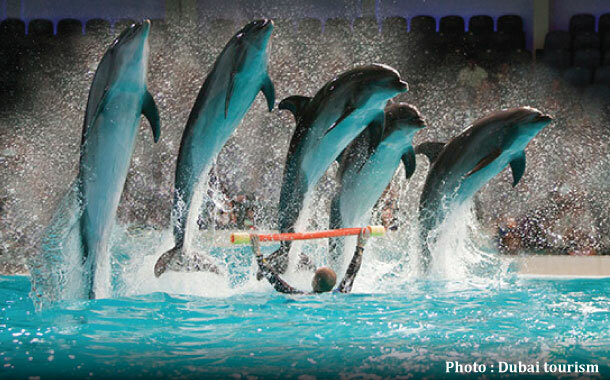 The athletic animals and birds at the Dubai Dolphinarium. What we don’t have we create; and what the world doesn’t have, we invent. That is literally and figuratively the motto of Dubai. Dolphins, no! So let’s build a huge park, call some exotic species of birds from around the globe and make it one of the most happening places in the world. Here the dolphins, seals and pretty looking birds do a couple of acrobatics for you. Watch in amazement as these small wonders get huge applauses. 4. 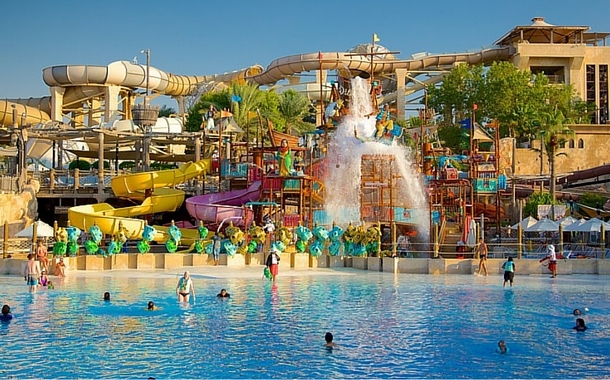 Chills and thrills at the Wild Wadi Water Park. Bang opposite the Burj Al Arab, the Wild Wadi Water Park is one other wonderland in Dubai. Chills and thrills, this water park has a bundle of rides for family and kids. Sit in some heart-throbbing capsules and get ready to scream your way out as your ride reaches various highs and lows. 5. Earn and learn at KidZania. Not only is it entertaining and fun for kids, but also informative as it gives them a glimpse into the complex workings of the grown-up world. A safe, educational environment, this place allows kids to try out different professions. Right from bankers, firemen, doctors to actors, children are given a chance to try out different career options. Watch kids try out one dream job after another, enjoying it all the while. 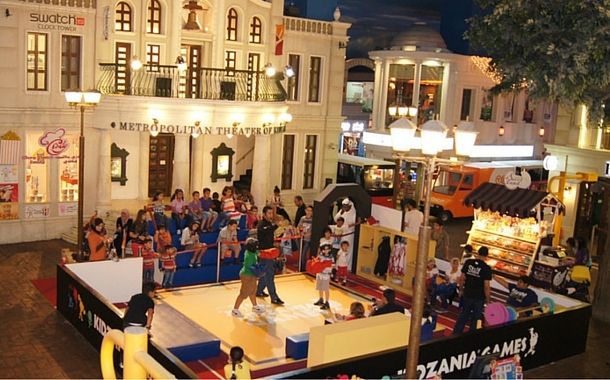 Located in Downtown Dubai, watch children’s make-believe world come alive at KidZania. Soar over the majestic skyline of Dubai and a get glimpses of its high rises like Burj Khalifa, and a view of the beautiful Palm Jumeirah. Circle over Port Rashid and head inland to view the Dubai Creek. End this journey with a spectacular sea landing, and then step off onto dry land again. Safety is given paramount importance so that your experience can be enriching. 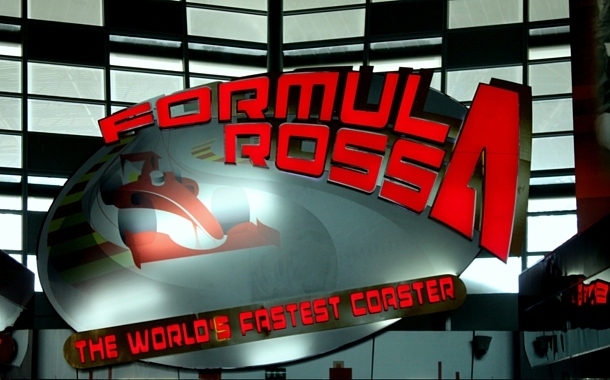 If you were in the capsule of Formula Rossa, you’d outrun a cheetah. No kidding! This Formula One themed adventure park boasts of the fastest ride in the world going up to 240 km/hr. Happy New Year, the movie might not evoke great memories, but Atlantis surely does. Although, credits to the cinematographer for capturing Atlantis, The Palm so well and elegantly. 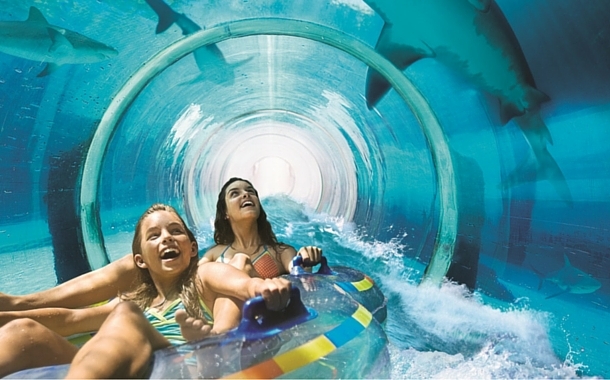 There’s a whole another world at the Aquaventure and The Lost Chambers, with fascinating river rides, shark safaris, interactive aquatheatre shows and some secrets that are only revealed to those who go. Here’s one we know of, you can even snorkel and scuba dive. Oh Dubai, you look so beautiful from up there! 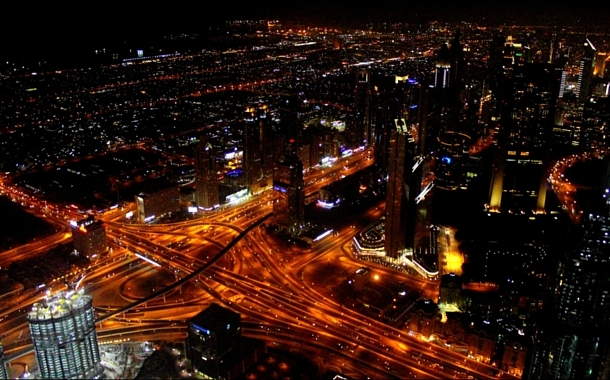 Like the disco, the city lights of Dubai dazzle from every corner. You’ll feel the nip in the air as you step on the observation deck of Burj Khalifa. There are experiences, then there are some more experiences, and then you have Burj Khalifa. 10. Sailing over the Dubai creek with the dazzling city lights at the backdrop. If cruising through the peaceful water, with the wind in your hair and a starry night as your backdrop is your ideal romantic scenario, then Dhow Cruise is the cruise you need to be on. 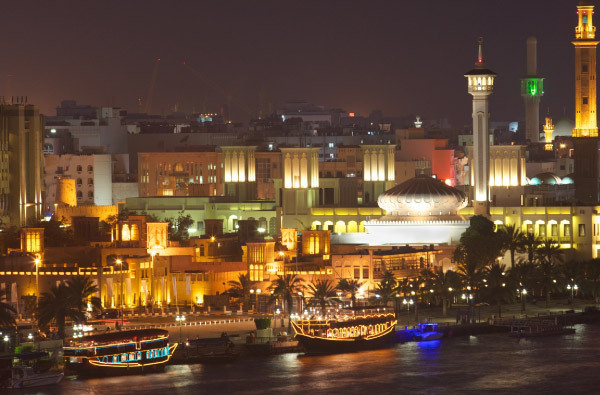 Enjoy this exotic experience of cruising through the Dubai creek getting a glimpse of this beautiful city with your loved one by your side or even family. Music, dance, and a scrumptious barbecue buffet dinner, the perfect setting, for an entertaining night. Now that you know of all the magic Dubai has in store for you, all that is left is to book your Dubai holiday package and set off to this land that has everything to offer.